Discounts are also available for booking on more than one course, for groups and for academics. Contact us for a quotation. Our courses provide valuable technical knowledge and skills for those aspiring to develop their career in the analysis of pharmaceuticals. Not only will these new abilities allow you to attempt more advanced tasks but will also enhance your CV. We provide a Certificate of Attendance which may, if desired, be upgraded to a Certificate of Training on successful completion of the post training assessment. At MTS we like to go that extra mile. When you attend one of our open enrolment courses you not only get comprehensive course handouts detailing the topic but we also like to give away other free extras such as a complimentary copy of our book, Validation of Analytical Methods for Pharmaceutical Analysis, (RRP £29.90) when you attend the course of the same name. We also have an aide mémoire to assist you during method review prior to transfer to another laboratory. For HPLC users we provide a calculator containing a range of useful information, including equilibration times, mobile phase preparation and method development. All delegates on MTS training courses receive post training support. This means that if you have any questions when you go back to work and start to apply the learning from our courses, you can send them to us. 6. Christmas Markets in Berlin are Fabulous! Scattered throughout the city, Berlin has a huge variety of beautiful Christmas Markets selling festive treats such as traditional gifts and decorations, mulled wine, and specialty foods. 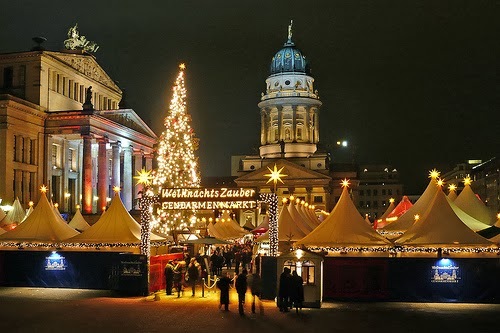 Why not combine some professional development on our training courses with a visit to a Berlin Christmas market? Just complete the online booking form for the courses you would like to attend or contact us. 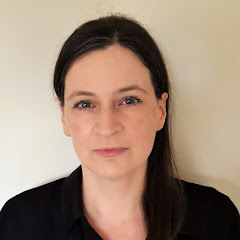 Limit of Quantification: Does it matter? Defined as "the lowest amount of analyte in a sample which can be quantitatively determined with suitable precision and accuracy" in ICH Q2(R1), limit of quantification (or 'quantitation limit' in the ICH terminology) is an important method performance characteristic which is typically demonstrated during analytical method validation. Because the method validation guidance in ICH Q2(R1) presents a number of methods for estimating the LOQ, it is tempting to conclude that it should be investigated during method validation studies. However, the determination of the LOQ is integral to the development of an analytical method which seeks to quantify low levels of compounds in sample matrices, e.g. the determination of impurities and/or degradation products. Therefore it should be established that the required level can be achieved when developing the method and then merely confirmed as part of method validation. The LOQ is expressed in terms of 'suitable precision and accuracy', therefore it is essentially a user defined level since the analyst must decide what level of precision and accuracy is suitable.For example, a requirement for precision of 5 %RSD would result in a higher LOQ that a requirement of 10 %RSD. For many methods the lowest concentration level that is required for a method is defined by the reporting threshold. For example, an impurities method may have a reporting threshold of 0.05% w/w with respect to the amount of drug present, as directed in ICH Q3A. Therefore, in method development it would be ensured that the method is designed to work at 0.05%, and in validation it would be demonstrated that suitable precision and accuracy are obtained at 0.05%. In effect, the actual LOQ for the method is not relevant since no value below the reporting threshold will be reported. So, to go back to the original question, "Limit of Quantification: Does it matter? ", the answer depends on the requirements for a particular method. If the true LOQ for the method is required then it does matter and should be thoroughly determined during method development and confirmed during method validation. However, if the lower limit of the range of the method is predetermined, such as a reporting threshold, then whether the method is actually capable of quantitative measurement below this value is not relevant, thus it may not matter (provided of course that the method is capable of quantitative measurement at the reporting threshold). Want to know more about analytical method validation? 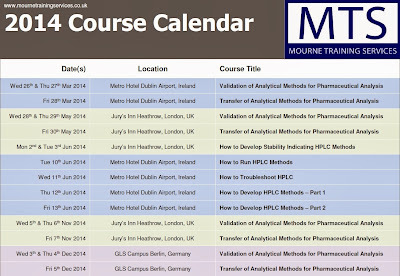 Visit the course list page on the MTS website for dates and locations of our open enrolment training course, Validation of Analytical Methods for Pharmaceutical Analysis. The course may also be delivered at your site as in-house training. Contact us for more information and a quotation. Prices held at 2013 rates! Our schedule for open enrolment training courses in 2014 is now available. We are offering courses on method validation, method transfer, developing HPLC methods (including stability indicating methods), introduction to HPLC and troubleshooting HPLC. The locations are Dublin, London and Berlin. Click on the image for the 2014 schedule. Contact us for more information. Online booking forms will be available on the MTS website soon.